We’d love your help. Let us know what’s wrong with this preview of Brief by Joseph McCormack. The only way to survive in business today is to be a leancommunicator. Busy executives expect you to respect and managetheir time more effectively than ever. You need to do thegroundwork to make your message tight and to the point. The averageprofessional receives 304 emails per week and checks theirsmartphones 36 times an hour and 38 hours a week. This inattentionhas spread to every part of life. The average attention span hasshrunk from 12 seconds in 2000 to eight in 2012. Author Joe McCormack tackles the challenges of inattention, interruptions, and impatience that every professional faces. Hisproven B.R.I.E.F. approach, which stands for Background, Relevance, Information, Ending, and Follow up, helps simplify and clarifycomplex communication. BRIEF will help yousummarize lengthy information, tell a short story, harness thepower of infographics and videos, and turn monologue presentationsinto controlled conversations. To ask other readers questions about Brief, please sign up. Зачем читать эту книгу? Для того, чтобы вас услышали в условиях атакующих со всех сторон потоков информации, нужно излагать информацию коротко и понятно. Почему это необходимо и как это сделать наилучшим способом читайте в книге, или короче :) ниже. * Составьте план или интеллект-карту выступления. * Ключевые мысли должны прозвучать в течение первых пяти минут. * Людям не нравится, когда им что-то продают, используйте сторителлинг — структурированные истории. * Слушайте своего собеседника, клиента, покупателя: вместо длинных монологов используйте управляемые диалоги. * Визуализируйте! Используйте инфографику, картинки и короткие видеоролики. * Оптимизируйте совещания, задавайте себе вопрос «зачем я здесь нужен?» Может быть вместо совещания лучше краткий отчет? * Сокращайте выступления, попробуйте «продать, пока едете в лифте». * Плохие новости сообщайте сдержанно и доброжелательно. * Говоря о проделанной работе, говорите о результатах. * Форматируйте текст: разбивайте на абзацы, выделяйте главное. * Не производите информационный мусор, не пишите лишнего в соцсетях. * Делитесь хорошими новостями, благодарите за хорошо проделанную работу. * результат — убедительный вывод, развязка, концовка. This book was thoroughly unimpressive. The short chapters are often interchangeable, reiterating material from a different angle instead of digging deeper, and info boxes that cover pre-established concepts regularly interrupt the text flow. Rather than delving into psychology or behavioral science, the book depends on long, skim-worthy stories about people the author has worked with and how they've solved their communication problems. None of it gripped me. Someone who works in the corporate sec This book was thoroughly unimpressive. The short chapters are often interchangeable, reiterating material from a different angle instead of digging deeper, and info boxes that cover pre-established concepts regularly interrupt the text flow. Rather than delving into psychology or behavioral science, the book depends on long, skim-worthy stories about people the author has worked with and how they've solved their communication problems. None of it gripped me. Someone who works in the corporate sector might find this more worthwhile. However, since I enjoyed reading the business book "Switch" in the seventh grade, my lack of involvement in the business world is no excuse for how this book failed me. A book about being brief almost sounds ridiculous, until you get your hands on this one. One of the tenets of the book is that in order to master brevity you need expertise. Joseph McCormack certainly does and demonstrates it in both his writing style, the book's structure, and his use of the techniques that he proposes--headlines, visuals, and stories. The book is so neatly arranged that the reader can navigate the messages and the advice with ease. McCormack starts by raising awareness about th A book about being brief almost sounds ridiculous, until you get your hands on this one. One of the tenets of the book is that in order to master brevity you need expertise. Joseph McCormack certainly does and demonstrates it in both his writing style, the book's structure, and his use of the techniques that he proposes--headlines, visuals, and stories. The book is so neatly arranged that the reader can navigate the messages and the advice with ease. McCormack starts by raising awareness about the suffocating noise, information clutter, and competing demands that interfere with our ability to be heard in almost any forum. Then he provides the insights and content that cleanly capture what we need to do and how we need to do it. He doesn't minimize the effort it takes to be brief. It's work and requires mental muscle memory, a technique he illustrates and explains. He drives home the career, success, and growth value of being brief in our communications whether it's to influence, sell, or advance. The value is made plain and the techniques to achieve it accessible. The author clearly knows what he's talking about and has some strong kernels of adviced peppered through the book but frequently fails to follow his own advice. For instance, one of the major points he highlights is the ubiquity of interruptions in modern society and the added importance of brevity as a result. He then goes on to fill the book with 'Brief Bits' that have small break-out boxes of stand alone text that are a constant interruption from the primariy narritive. Chapter 11 even has a ' The author clearly knows what he's talking about and has some strong kernels of adviced peppered through the book but frequently fails to follow his own advice. For instance, one of the major points he highlights is the ubiquity of interruptions in modern society and the added importance of brevity as a result. He then goes on to fill the book with 'Brief Bits' that have small break-out boxes of stand alone text that are a constant interruption from the primariy narritive. Chapter 11 even has a 'Brief Bit' about interruptions and 'cutting out the fluff' despite being a fluffy interruption itself. McCormack has spent his career helping people to think first before talking. Common sense isn't that common, and it can save time, confusion and money. Why I started this book: Professional Reading list and a short book. Win, win. Why I finished it: Great audio and a great reminder. The final judge of any self-help/communication book is if you are motivated to follow their advice. So far, so good. Simplify ideas by using BRIEF mind maps to outline information. Make your ideas pop with the power of pictures. Exchange corporate-speak for an engaging story. Employ active listening to turn monologues into controlled and balanced conversations. There's really only an HBR article worth of content in this book. It seems like the book was written to serve as a raison d'etre for speaking gigs and as merchandise for the speaking gigs. The main argument of the book (that clear, concise communication is valuable but takes time and is aided by certain techniques) is certainly correct, but it does not take a book to present this argument. I'd recommend avoiding this book but perhaps watching the author speak in a Youtube video. I only read the b There's really only an HBR article worth of content in this book. It seems like the book was written to serve as a raison d'etre for speaking gigs and as merchandise for the speaking gigs. The main argument of the book (that clear, concise communication is valuable but takes time and is aided by certain techniques) is certainly correct, but it does not take a book to present this argument. Неплохая книга о том, как научиться лаконичности :) Автор предлагает 4 практических инструмента, которые научат выступать и писать короче. Книга ориентирована на бизнес-коммуникации, но м.б. полезна и в жизни. I really liked this book. The term "lean communication" suits it very well. Avoiding waste, getting to the point and making your communication effective, while centering your message on the receiver are key points that I registered after reading the book. If you want to become a more effective speaker and a more pleasant communicator this book is for you. It was too long. Seriously nearly nothing you haven't thought of yourself. If you need to be convinced of the necessity of brevity, this book doesn't even do a good job. It uses a 'I did this and that' examples that have little impact on me as a reader and are completely forgettable. Could have been shorter. An article rather than a book. Worth skimming through; content is all on the surface; no deep drilling required. Good, 'brief', practical book on optimizing communication in the age of inattention. Definitely illuminated things for me as someone who does executive training and presentations from time to time. I've always chalked up the unfailing occurrence of execs giving dull cow eyes during a presentation to do with the fact that they didn't gaf about anything below a management level. It's now clearer to me that, given the business of their schedule, they had tuned out the presentation because the aweso Good, 'brief', practical book on optimizing communication in the age of inattention. Definitely illuminated things for me as someone who does executive training and presentations from time to time. I've always chalked up the unfailing occurrence of execs giving dull cow eyes during a presentation to do with the fact that they didn't gaf about anything below a management level. It's now clearer to me that, given the business of their schedule, they had tuned out the presentation because the awesomeness wasn't front-loaded, because it may have been bogged down in what they believed was minutiae, because there was no story, because there were no visuals (I've historically presented with no powerpoint deck), or because it just went on for too long. I feel better equipped to tackle future interactions now. This was a book that practiced what it preached. It was well structured. It had a beginning, middle and end. It stated the point up front, then supported it. It didn't get bogged down in big words. It told a story. It was brief. It did all of the intellectual heavy lifting for the reader, requiring less work to understand this than it took the authors to understand it. The biggest takeaway from this book for me has been the idea that I don't really respect other people's time, and that if my interest is in being more effective, I will perform actions that indicate that. The last section of the book is a brief action plan that offers the large points of the book in a "Truth, Implication, Plan and Practice" format with a pithy 2 sentence chunk. I will paste just the chunks here. "Your attention, please. Manage the Elusive 600 (the excess mental capacity we all have and where inattention lives); it's your responsibility. Why, why, why? Get to the reason quickly, and revisit it. Map it out. Prepare what you'll say on paper before you dare speak. Give me a headline. Say it plainly, directly, and quickly. Take time to trim. Just because you think it, doesn't mean you have to say it. Listen closely. Active listening is vital to staying connected with your audience. Just say no (to presentation mode). Avoid speeches and monologues; always keep your information personal, professional, and conversational. Cut it in half. Whatever time you think you have, always take less. Just say it (the wrong way). Say something simply in your own words to ensure authenticity. Paint a picture. Share a story, analogy, or even a hypothetical example to help people visualize what you mean. Pause, please. Stop talking to allow room for a response, comment, or question. Don't use notes. Be willing to leave your prepared paperwork aside and just say what you mean to say. Don't get too comfortable. Cut it short whenever you're on a roll. Put it on a cracker. Don't cook up a verbal meal; first serve a short summary to test your audience's appetite. Nobody cares unless you do. Remind yourself that if you're not passionate, nobody else will be. Make sure no assembly is required. Make it easy to listen and understand by giving all the essential elements logically organized. Tell versus sell. While people hate being sold something, they do love stories. What's in it for me? There always needs to be a payoff. Know what it is, and deliver it. Commit to clear and concise. Success means deciding to be disciplined." A not-so-brief book better suited to a HBR or Forbes article, as it often repeats itself and throws in forgettable 'case studies' that don't do much to advance the writer's point. The frequent text box interruptions don't do the reader any favours either. Being brief is not just about time. What's more important is how long it feels to the audience. It is a balance between being concise, clear and compelling. Give people enough to act on, but not choke on. Board members are very busy and have lit A not-so-brief book better suited to a HBR or Forbes article, as it often repeats itself and throws in forgettable 'case studies' that don't do much to advance the writer's point. Board members are very busy and have little patience. Their attention is divided between the issues of your company and the other companies they run or advise. Their knowledge is a mile wide and an inch deep. Be prepared to have an executive summary conversation, as opposed to an hour-long presentation. Speak in headlines, or risk losing your audience. Real brevity invites, meaningful, controlled conversations. It is a disciplined conversation, where what you're talking about matters to the person you're talking to, and your active listening tells you what matters to that person. It's not about controlling the conversation, but controlling yourself in the conversation. In most cases, the slides are less for the decision maker and more for the staff and subordinate commanders on the way up. Everyone wants to protect the decision maker. The slides are less valuable for the actual briefing. You state it simply. Doesn't mean it's simple, but you do it so that the world gets it and can understand it. Regularly check in with your audience. You can't adjust if you don't check in. It is important to listen to gauge how much your audience already knows or doesn't know, so you can adjust accordingly. Never tell people what they already know. When firing someone, avoid the temptation to over-explain to compensate for the bad news. Be focused on delivering the information. The boss isn't the person to give that person a lot of comfort, because they made the decision. To be brief, it requires a lot of work to have a thorough understanding of the subject. This may include writing outlines and creating mind maps. You also need to refine the summary of your topic - what would be the headline and narrative? Don't give a bunch of facts. "Plan and practice" is the advice given over and over so you can deliver stories that are to the point, observe your audience reactions, and adjust your message to what they want. Книга, несмотря на название довольно затянута, хотя очень актуальна. А) 7 причин того, почему мы не бываем коротки (смертн Книга, несмотря на название довольно затянута, хотя очень актуальна. 1. Трусость. «Я боюсь, что мне трудно это выразить. На этот счет есть множество точек зрения». Займите твердую позицию и откровенно скажите то, что думаете. 2. Уверенность. «Я знаю предмет настолько хорошо, что мог бы говорить о нем часами». Сэкономьте наше время и не говорите. 3. Бессердечность. «Это займет всего минуту...» В самом деле? Разве вы не видите, как я занят? Если вы не уважаете время других людей, минута превращается в час. 4. Спокойствие. «Как только я начинаю говорить, я успокаиваюсь, и меня уже не остановить». Вы можете взять себя в руки и нажать кнопку «Стоп»? 5. Неразбериха. «Потерпите. Это просто мысли вслух». Если в вашей голове каша, зачем делиться ею с другими? 6. Сложность. «Это действительно сложная проблема. Ее нельзя объяснить просто». Но ваша задача — облегчить для нас ее понимание. 7. Небрежность. «Я сказал это вслух?» Именно так. В следующий раз думайте, прежде чем что-то сказать. 4. Наглядность - идея также проста: один наглядный образ может легко заменить десятки слов. Также может решаться через интеллект-краты. 1. Внимание! Управляйте своими «недосказанными 600 словами» (лишней в данный момент информацией, которой обладает каждый и которая может стать причиной нашей невнимательности). Это ваша обязанность. 2. Зачем, зачем, зачем? Быстро переходите к причине, а потом еще раз напомните о ней. 3. Составьте план. Перед публичным выступлением запишите речь на бумаге. 4. Говорите заголовками. Выражайте мысли просто, прямо и кратко. 5. Выделяйте время на корректировку (на сокращение текста!). 6. Слушайте внимательно. Активное слушание крайне важно для поддержания связи с аудиторией. 7. Просто скажите «нет» (формату презентаций). Избегайте речей и монологов, ваша информация должна быть персональной, профессиональной и передана в разговорном стиле. 8. Используйте силу троек. Для сохранения порядка, концентрации внимания и сбалансированности разделите информацию на группы по элементам. 9. Сокращайте наполовину. Сколько бы времени у вас ни было, всегда сокращайте его. 10. Просто скажите то, что нужно сказать (имейте в виду, что это утверждение неверно!). Чтобы ваше сообщение носило персонализированный характер, говорите проще. 11. Нарисуйте картинку. Расскажите историю, используйте сравнение, чтобы помочь слушателям представить, что вы имеете в виду. 12. Делайте паузы. Останавливайтесь во время речи, чтобы слушатели могли ответить, прокомментировать или задать вопрос. 13. Не используйте записи. Отложите подготовленные записи в сторону. Просто говорите то, что хотите сказать. 14. Не устраивайтесь поудобнее. Сокращайте продолжительность выступления, даже если вы в ударе. 15. Вначале — закуски. Не готовьте словесное изобилие. Вначале подайте краткие выводы, чтобы проверить аппетит аудитории. 16. Всем все равно, пока вам самим не станет интересно. Напоминайте себе, что если вы не будете увлечены темой, другие ею также не заинтересуются. 17. Убедитесь, что «сборка не требуется». Сделайте так, чтобы вас легко было слушать и понимать, логически выстроив все необходимые элементы. 18. Говорите, а не продавайте. Людям не нравится, когда им что-то продают. Они любят истории. 19. А что это даст лично мне? Выгода должна присутствовать всегда. Узнайте, какую выгоду хочет получить слушатель, и изложите ее. 20. Придерживайтесь четкости и краткости. Успех всегда означает принятие решения в пользу дисциплины. Лично для меня книга была очень актуально для проверки полноты используемых мной способов добиться краткости. В ней нашел довольно полный перечень, хотя этот материал можно было изложить, как это ни парадоксально, существенно короче и яснее. В целом рекомендую прочитать книгу, если предоставленный выше материал вызывает вопросы и требует дополнений. I was very interested to read this book, but couldn't even make it all the way through. For a book called Brief, this book dragged on and on saying seemingly the same thing over and over. It could have easily been made into an article saying "People are busy and don't care what you have to say, so say it as succinctly as you can". It really seemed like this writer has lots of experience with it and was very knowledgeable about the subject, but the book seemed to jump around with tons of little pa I was very interested to read this book, but couldn't even make it all the way through. For a book called Brief, this book dragged on and on saying seemingly the same thing over and over. It could have easily been made into an article saying "People are busy and don't care what you have to say, so say it as succinctly as you can". Must read for those wanting to improve their communications skills. The author highlights the importance of brevity in today’s information saturated environment and provides tools and recommendations for making your own communications more impactful. Bottom line the title says it all -say more and have a bigger impact by saying less. This book is a quick and easy read about tightening up formal, professional communication. It's filled with mnemonic devices and other corporate-training-esque packaging. While it stresses the importance of keeping all communication short and to the point, including casual small talk, the practical how to bits of it don't really offer as many suggestions for non-planned communication. من منا لا يحضر إجتماعا لساعات ويخرج من بدون فائدة بسبب كثرة الكلام التي لا تفيد؟! The author covers a lot of areas, but I particularly found "mapping" and the B.R.I.E.F. approach, (Background, Relevance, Information, Ending, and Follow up), useful and have used it already. The section on how busy people are with Social Media, emails, meetings, etc could have been shorter since my guess is that anyone reading the book is already familiar with it. Read it if you have to attend meetings all the time. 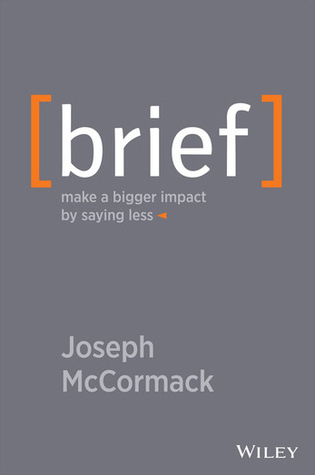 Brief is a great book both about one on one communication and business communciation. Being concise in conversations is a lost art and people will respect you for it and want to speak to you more. The people who speak the most are doing so because people avoid speaking to them they want to make the most of it when someone does. Meetings can be sped up through diagrams which allow people to understand concepts more quickly and attendees to remember more of what they saw and heard. My graduate program in public policy taught the importance of brevity, but this was a nice reminder 5 years later. I especially appreciated the tools it provided and the specific facts about attention span. I also found it validating since I struggle with being overwhelmed by information and frustrated with how conversations and meetings go at work. Actual rating 2.5 if I could give a half. There were some valid points made, tips offered and I can see myself using a few during the ol’ 9-to-5er. But as other reviews have stated: there is a lot of examples that end up being overkill, and the drawings and “bits” I found useless and disruptive at times. This book was recommended to me at work and I really enjoyed it. It changed the way I define brevity. When looking at past presentations or meetings through the lens of this book, I notice that the ones that follow the practices from this author are the ones that stick with me the most. I am definitely going to use the principles outlined going forward. Another great book for communication. The first few chapters about why being "brief" is so vital in the workplace when conducting a meeting, sharing information with others, and why we struggle with being brief were very informative. I have a lot of bosses who should read this book, and a lot of co-workers who abuse meeting times that would benefit from this book. Great resource. If you have trouble being heard, check this book out. Lots of practical advice on becoming a more concise and effective communicator. I’ll be BRIEF: unhelpful name-dropping from beginning to end, repetitive and a waste of time. The author could have taken his own advice and write all this info using an Infographic. DO NOT waste your time.